This article first appeared in The Edge Financial Daily, on October 30, 2018. KUALA LUMPUR: Food and beverage group Berjaya Food Bhd has stepped up its share buy-backs over the past month, spending nearly RM20 million in four weeks to support its declining share price. In a Bursa Malaysia filing yesterday, the group said it paid RM419,907 to buy back 300,000 of its own shares between Oct 22 and Oct 25. The purchases last week meant that Berjaya Food had acquired a total of 13.78 million shares between Sept 28 and Oct 25, paying RM19.96 million over a four-week period. From that amount, RM16.21 million was spent in a span of just six trading days — between Sept 28 and Oct 5 — to buy 11.16 million shares. 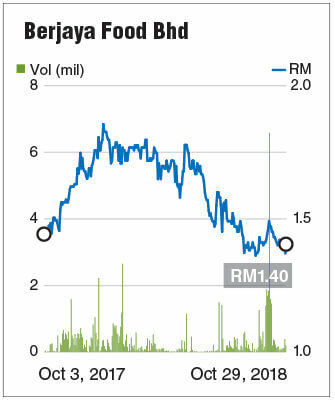 This year, Berjaya Food had been on a downtrend since its one-year high of RM1.85 on Jan 8. Since then, it had fallen by as much as 29.2% in eight months to touch RM1.31 on Sept 12. The stock then recovered to hit RM1.49 on Oct 3 but fell again to as low as RM1.37 on Oct 26. The amount spent on its share buy-backs is significant compared with its cash reserves. As at July 31, Berjaya Food reported RM18.88 million in cash and bank balances with another RM891,000 deposited with financial institutions. For the first quarter ended July 31, 2018 (1QFY19), Berjaya Food reported RM6.24 million net profit, up 16.9% year-on-year, while revenue rose 4.5% y-o-y to RM161.38 million. It announced a one-sen dividend per share. Berjaya Food attributed the stronger earnings to same-store sales growth and better profits from its Starbucks cafes in Malaysia. It also had stopped consolidating losses from its Indonesian Kenny Rogers Roasters operations, which was sold in FY18. Notably, its cash reserves dwindled in 1QFY19 despite stronger operating cash flow due to an increase in repayment of borrowings. In 1QFY19, Berjaya Food’s cash pile shrunk to RM18.88 million compared with RM31.38 million a year prior. Over the same period, its short-term borrowings decreased from RM141.76 million to RM125.5 mllion. However, its operating cash flow improved to RM24.21 million in 1QFY19 compared with RM6.94 million in 1QFY18. Historical filings with Bursa Malaysia showed that Berjaya Food did not start buying back its shares this year until July 20. Between July 20 and Aug 2, it bought 700,460 shares for RM849,624.25. Its share buy-backs this year so far nearly quadrupled its treasury shares from 5.02 million as at end-2017 to 19.5 million as at Oct 25. Yesterday, Berjaya Food closed three sen higher at RM1.40. Its market capitalisation was RM507.34 million.